Check out here the list of room assignment for Cagayan de Oro (CDO), Davao and General Santos. Aside from Cagayan de Oro (CDO), Davao and General Santos, the September 2018 LET will be administered in Baguio, Laoag and Rosales, Bacolod, Catarman (Northern Samar), Cebu, Iloilo, Legaspi, Lucena, Manila, Tacloban, Tuguegarao, Pagadian and Zamboanga. Ask LNG po bakit wala pong soc.sci major a ng Davao. 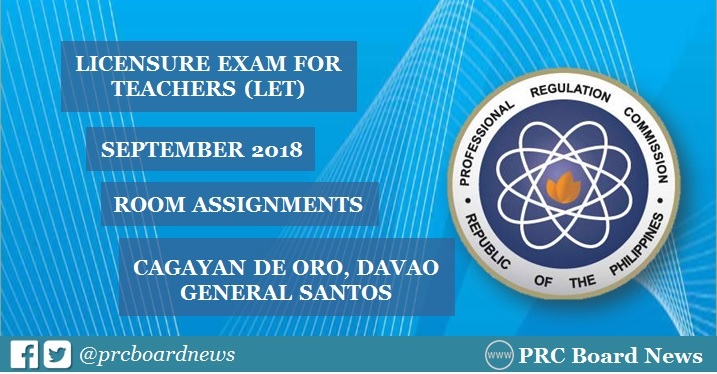 The site is regarding The Professional Regulation Commission (PRC) that publicized the list of room assignment and guidelines for September 30, 2018 on Sunday, where licensure exam for teachers (LET) or teachers board exam. I want to ask about bestessays.com. You can get to know more about the assignments of Cagayan de Oro (CDO), Davao and General Santos on internet.